Business travellers will love this smart little printed speaker and weather station. It works with 3.0 Bluetooth to provide wireless music and basic weather information like the temperature wherever you need it. The attractive mirror finish makes this a stylish device that would look at home on any desk or bedside table. it comes with a rechargeable Li-ion 2200mAh battery, and it provides excellent sound quality. This would make a great gift to employees travelling on business trips or to corporate clients, but it would also be useful for any travellers. We typically print on the front of this product, however other positions may be possible - please check by using our on-site chat. This speaker product is printed in up to 2 colours via pad print, which is a technique suitable for almost all artwork and shapes. 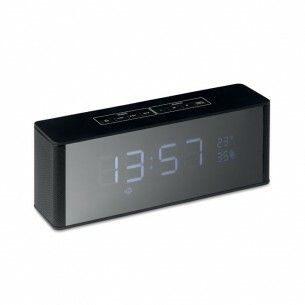 This speaker/weather station is made from plastic and can be purchased in black.